​Carmen Torruella-Quander, a first generation Washingtonian, ancestry of the Dominican Republic, is an internationally accredited classic artist. She began her formal artist studies at the Corcoran School of Art, Washington, D.C., and continued artistic studies in New York (Pratt Institute, the Art Students’ League, and New York University). Now a well-known representational artist, art educator, and curator, her art works are held in many corporate and private collections nationally and internationally. Carmen continues to enhance her artistic capabilities through worldwide travel and education, but emphasizes that she uses her classical form to relate to her personal daily experiences. Whether consciously or not, Carmen always seeks to be influenced by the spirit of the ancestors, and paints most of her works within a context of how they would perceive her artistic message. Whether African-based or Latino-influenced, her works portray a sense of place, a message of hope, and a determination to succeed by those who extend from the African Diaspora. As well, as being a classic painter, many of her painted subjects are historical in nature, great men and women who paved the way for a fuller appreciation of the contributions of people of African or Latino descent. Conversely, often she paints unknown persons or places, but the sense of determination, and the strong atmosphere of focused accomplishment continues to emerge in the final result. Her wonderful art pieces are the creative results of personal visits to places in the United States, as well as Central and South America, the islands of the Caribbean, the Philippines, the Middle East, Europe, and several countries in Africa. 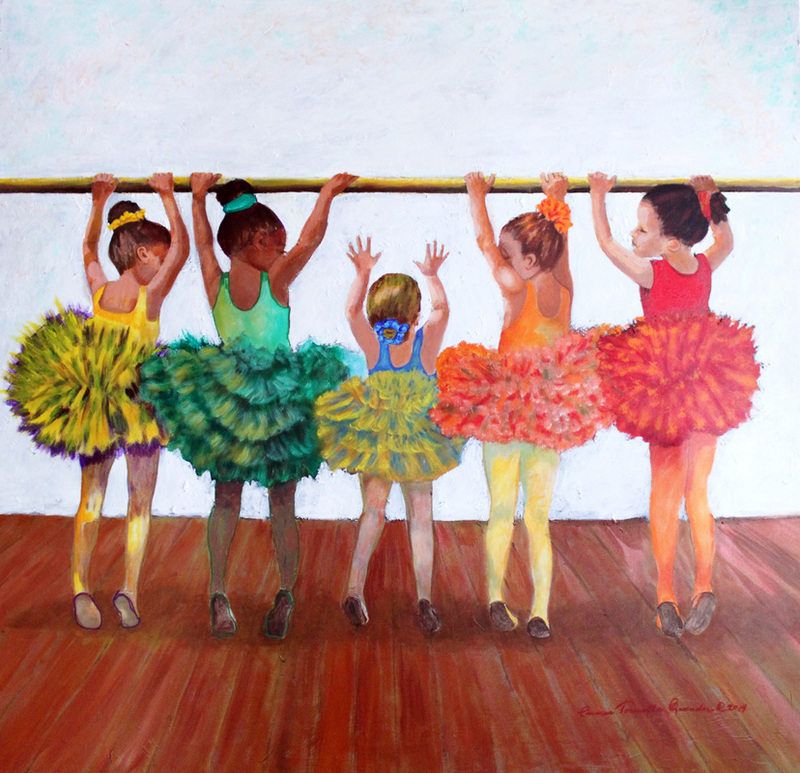 "This painting depicts five little girls, of different races, dancing together."